The Style Arc Jacinta (note: affiliate link) is another one of those patterns I made a few years ago and decided to make again. 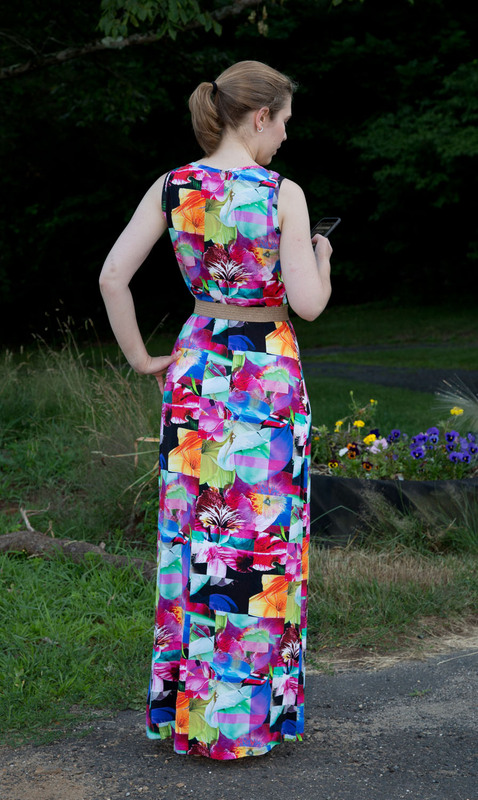 It is my go-to pattern for when I want to make a maxi dress out of a bold patterned knit. I made three new Jacintas for a little vacation I took last month to Virginia Beach. I have a close friend from college that lives down there, and after literally years of her telling me to visit, I finally got up the courage to take her up on her offer. I’m a nervous and inexperienced traveler, so getting on a plane by myself was a HUGE deal to me, especially since I had been on one only once before in my entire life! I’m glad I went though – it was great to bond and re-connect. Beach babes! We’ve been told many times before that we could pass for sisters. My final dress was from an Italian rayon/lycra jersey, this time from Mood. There’s still some available! One thing I did differently from last time is instead of sewing a tuck at the V, I cut the ends of the binding strip at a 45 degree angle, making a seam at the center front of the binding. This gave me a nice sharp angle at the center front. I then attached the V section of the neck binding to the dress via my regular sewing machine, but only for an inch or two past the center front. Then I finished attaching the binding on my serger, and topstitched with a chain stitch on my Janome Coverpro. I think it gives a neat, professional finish, and doing that little section on my sewing machine gave me greater control vs trying to manipulate that corner on a serger. These are all so gorgeous and look fantastic on you! How do they look without belts? Now I really want to make one but I don’t love wearing belts with dresses. On my body? Terrible. I’m very pear shaped, so without the additional shaping and structure provided by a belt my waist gets totally lost. That’s my particular issue though – if you like how you look in an unbelted t-shirt dress you’ll probably like how this dress looks too. I used rayon/Lycra jersey for all of my Jacinta dresses…and as you probably know that tends to be a thin and clingy fabric. The belt lets me have a very fitted look at the waist while still having enough ease so that you aren’t seeing every detail of my underwear ;). I should also add that I can never get a good fit – stretchy knit or not – without darts or seams in the back. If you have seen photos of me from the side you probably understand why! Same here on needing back shaping. Really, I mostly make separates and when I do make dresses, they always have a waist seam. But you’re inspiring me to get out of my comfort zone! Happy to hear you took the trip! I absolutely hate traveling – I only took that trip because it was to see her! Can’t decide which I like best on you. They’re all gorgeous. I love the look of these dresses – sophisticated, but probably quite comfy. I love the bold colours. Also they make your legs look a mile long! Btw, I’ve been lurking on your blog for a while and just wanted to say how much I appreciate all the work that goes into it. Your detailed posts are really helpful and I’ve learned a lot by reading them. The care you take with your photography is hugely refreshing compared to so many grainy iPhone/ over filtered insta pictures. And the quality of your sewing is really inspiring. This is definitely my favourite sewing blog. Thanks so much for taking the time to share your work with us! Sewists around the world are grateful! I have a much nicer photo setup than the vast majority of sewing bloggers – it is another interest of mine that I’ve chosen to explore and invest in. Fabulous dresses. I particularly love the purple passion one. I almost purchased that fabric in a brown colourway – so sorry I didn’t now – it looks fabulous.